(NewsUSA) – According to a recent study at Kent State University, the Association for Psychological Science (APS) and others, using pen and paper instead of laptops to take notes boosts memory and increases the ability to retain and understand concepts. Of course, in the past, handwriting was the only option for capturing key information. But if a pencil broke or the pen stopped working, important details could be lost. Then, along came the laptop and tablet, and taking notes seemed so much easier. But it turns out that taking notes by hand helps improve listening and cognition skills, and boosts the ability humans need to summarize information. The Journal of Psychological Science cites that taking handwritten notes appears to be more beneficial, as it helps one remember and understand the information given, as opposed to participants who mindlessly take verbatim notes on a laptop. With that in mind, enter Boogie Board, creators of the new Blackboard, a device often referred to as an “eWriter” that features Liquid Crystal Paper. 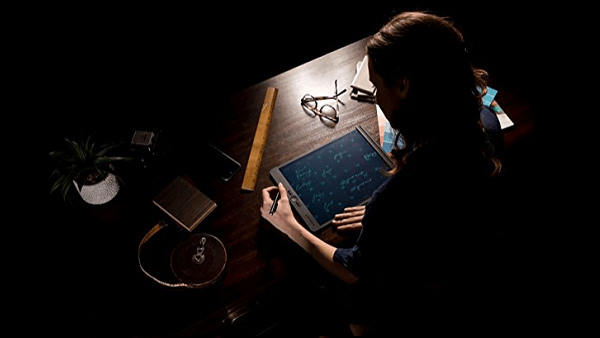 Blackboard allows users to write and erase electronically without using ink or paper: high tech meets traditional! “With Blackboard, we’ve arrived at an incredible cross-section where high technology allows us to create a back-to-basics experience that somehow feels revolutionary and familiar at the same time,” says Hunter Morris, Blackboard’s director of product design. “Quite ironically, we’ve developed a breakthrough tech product without the inconvenience of chargers, plugs or ports,” Morris adds. With nothing to load or charge, Blackboard writes with absolutely no lag or delay, just like pen and paper, making it convenient on-the-go. The new device comes in a large 8.5″ x 11″ letter-size, semi-transparent writing surface, and includes four different templates, which are also helpful in sketching out plans, taking notes, or planning your calendar. The screen is also perfect for tracing an image, map, photo, or even another digital screen. The new technology that makes Liquid Crystal Paper possible is the new, patented Exact Erase feature that allows users to easily clear the screen with the touch of a button, or erase small and large portions, as if using a pencil and eraser. Another reason to “write on” is the free app that makes it easy to save, organize, search, and share your work, doodles, designs, lists, notes and more. Unfortunately, deciphering your scribbles is something the Blackboard may not be able to help with. Writing is a technique that has been used through several millennia to teach, learn and communicate with one another. It just works. So why put yourself at risk for “mindless processing” when you can use a new technology that boasts 50 patents to help you boost memory and increase understanding of concepts and facts. Is a Blackboard old-fashioned? Hardly. Find Blackboard at Amazon or other retailers, including Staples, OfficeMax, Office Depot, Barnes & Noble, Fred Meyer, and more.